The tourism industry is what drives Siem Reaps’ economy and subsequent future. The temples of Angkor bring over 2million visitors to the area every year, which in turn create a wealth of job prospects for local people. The ability to speak, read and write English in Cambodia greatly improves career opportunities, which are otherwise unavailable to non English speakers. The Stepping Stones team understand the disadvantage which the members of Kok Thnot are placed at, because of financial hardship and their rural location. Building an English school in So’s home village was a natural choice for the team, as providing community members, especially the younger generation with access to free quality English Education and Vocational Training paves the way to brighter futures. Stepping Stones runs more than 30 English classes every day for over 600 local students, from Monday to Friday. Ages range from 5 to 25 (although there is no upper age limit) and each student is offered one hour of English tuition every day. Basic health and hygiene is taught at Stepping Stones. We teach our students oral healthcare and personal hygiene and follow this up with regular training sessions. Daily computer classes are run at Stepping Stones where we focus on teaching microsoft word, excel, powerpoint and introduction to the internet. Typing lessons in both Khmer and English are also provided. Sports classes are run daily, which are open to all students who attend the school. Activities include: Volleyball, football, games and general exercise techniques. These classes are designed to encourage a healthy, active lifestyle as well as promoting teamwork, communication and confidence in our students. All our teachers monitor their students progress and it is part of their role to offer assistance to students that are struggling with their studies. Our support classes offer smaller, more concentrated lessons for students needing a bit of extra help with their English. Our library is stocked will with many English and Khmer books for our students to read. We have classes daily for smaller groups of students to read with our librarian. Stepping Stones also offers a borrowing system where students can read books independently in our library or take them home to their families. The library also offers a computer facility. Stepping Stones has a designated Health Clinic that offers basic services to all our staff, students and the local community. Our experienced staff have completed their first aid training. In partnership with Penghu Dental Association we offer all of our students and the wider community access to free dental services, including regular check ups. Lessons on healthy eating and brushing your teeth are also provided. 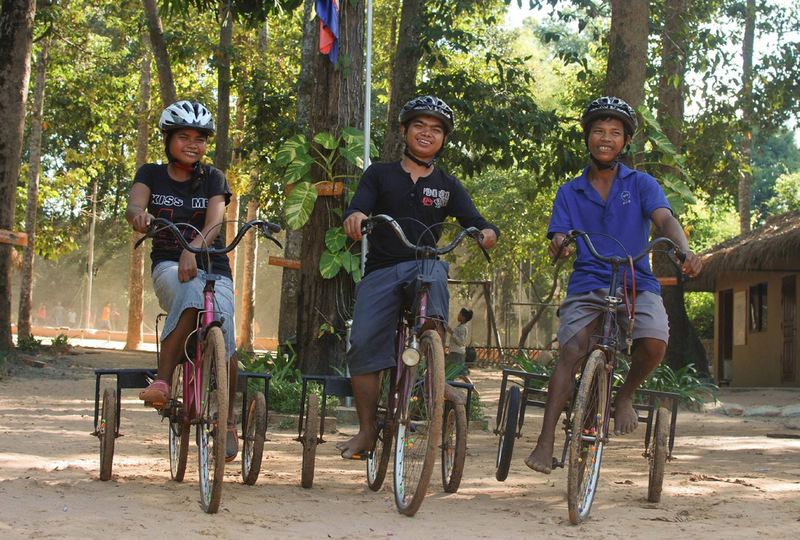 Khmer and English language classes and physiotherapy training are being given to the disabled students. Stepping Stones encourages these students to be involved with the school and with the support of Rob and Jo Parker, we have provided them bicycles. Starting with access to clean water at school we have now expanded to providing our whole community with clean drinking water through our Clean Water Program. Over 400 families now have their own filter that cleans water from wells and pumps making it safe to drink. Stepping Stones staff also provided intensive training in how to use and maintain their filters and regular visits are undertaken to offer support to ensure the filters are used correctly. Stepping Stones provides financial and emotional support and transportation assistance to families less fortunate in Kok Thnot village. 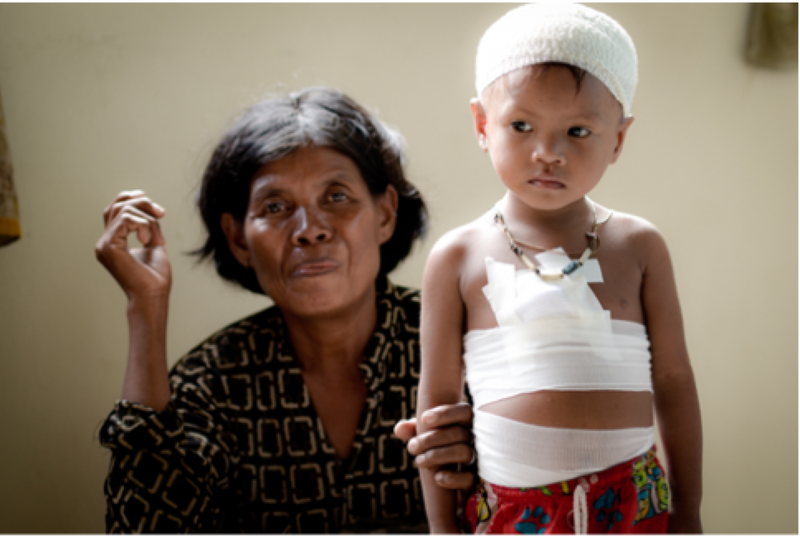 Healthcare in Cambodia can often be very expensive and some families put off going to the hospital till it is too late. Our clinic staff alongside our Management team work with individual cases to ensure that the necessary treatment is made available to those in need. As part of Stepping Stones’ belief that education is one of the keys to improving self sustainability, we actively encourage our team members to improve upon their existing knowledge and skills. As an organisation, we are dedicated to delivering quality over quantity and believe this starts at the top. At present, Stepping Stones School supports our full time teachers and volunteer trainee teachers to continue their own studies at university. This not only improves their English, but has dramatically increased their enthusiasm, confidence and motivation to provide the same high quality of teaching in their classrooms. 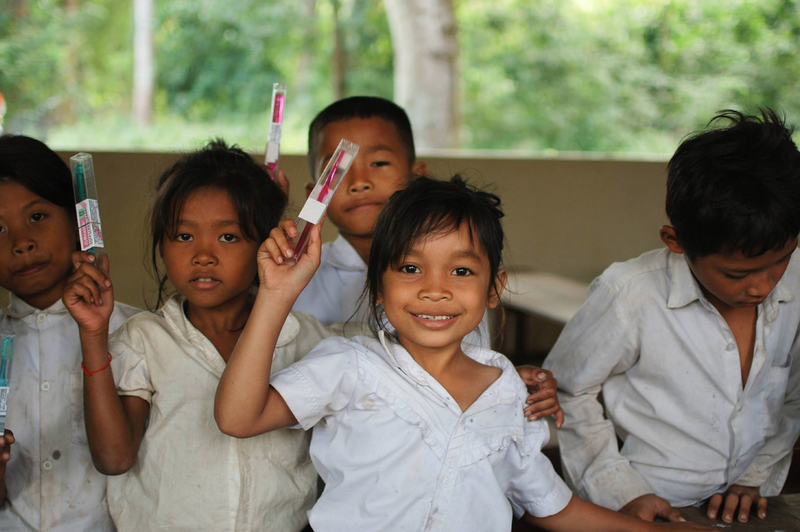 Stepping Stones depends entirely on the help and support of kind donations from generous individuals, and we work in partnership with Harvest Cambodia and Chance2study to provide this sponsorship program which aims to secure funding for our teachers ongoing education.